As the Saint Luke ordinariate community moves to downtown Washington DC next month, a new initiative is beginning, to build on an existing tradition of Sacred Music. 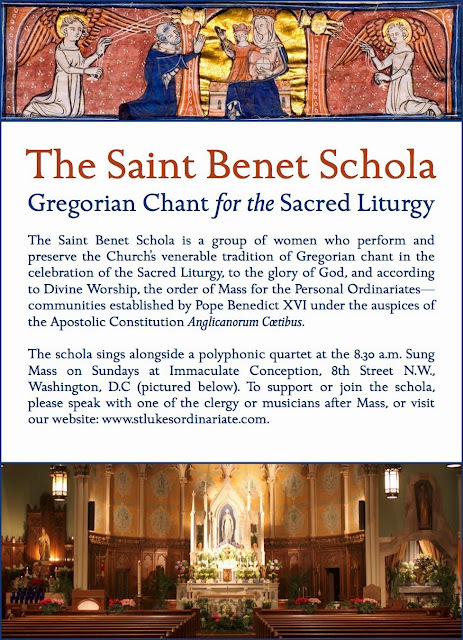 Named in honour of Saint Benedict and the Benedictine tradition of Gregorian chant, and with a nod of gratitude to Pope Emeritus Benedict XVI (who founded the ordinariates), the women of The Saint Benet Schola will provide the chant at the 8.30am Sunday Mass at Immaculate Conception, 8th Street NW. The group will draw on the Anglican plainsong tradition, whilst at the same time emphasizing the universal, Catholic nature of our worship, by singing the ancient chants and texts of the Sacred Liturgy.